^ Rein Taagepera. Expansion and Contraction Patterns of Large Polities: Context for Russia. International Studies Quarterly（英语：International Studies Quarterly）. September 1997, 41 (3): 475–504. JSTOR 2600793. doi:10.1111/0020-8833.00053. ^ 佚名 撰. 《元朝祕史》 卷一. 鲍思陶 点校. 济南: 齐鲁书社. 2005: 23. ISBN 7-5333-1481-6. 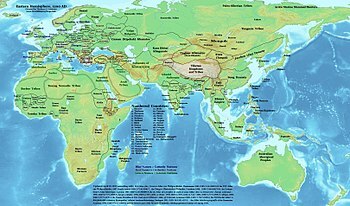 ^ Battuta's Travels: Part Three - Persia and Iraq 互联网档案馆的存檔，存档日期2008-04-23. ^ Ping-ti Ho, "An Estimate of the Total Population of Sung-Chin China", in Études Song, Series 1, No 1, (1970) pp. 33-53. ^ We Have Met the Enemy And They Are Small – A Brief History of Bug Warfare. Military History Now. [26 December 2014]. ^ Svat Soucek. A History of Inner Asia. Cambridge University Press, 2000. ISBN 978-0-521-65704-4. P. 116. ^ 1911 Encyclopædia Britannica/Crusades/8.The Crusades of St Louis:"but in the Mongol army there were many Christians, the results of early Nestorian missions to the far East." ^ Zerjal, Xue, Bertolle, Wells, Bao, Zhu, Qamar, Ayub, Mohyuddin, Fu, Li, Yuldasheva, Ruzibakiev, Xu, Shu, Du, Yang, Hurles, Robinson, Gerelsaikhan, Dashnyam, Mehdi, Tyler-Smith (2003). "The Genetic Legacy of the Mongols". American Journal of Human Genetics (72): 717–721. Herbert Franke（傅海波）& Denis C. Twitchett（崔瑞德）編：《劍橋中國遼西夏金元史》（北京：中國社會科學出版社，1998年）.